Like many offices in the United States, Motivating Systems is set up as an open office. While our open floor plan helps us to collaborate and function as a team, there are also plenty of times each of us needs to focus on a single task. That’s why at any given moment during the workday, you may see several of us working intently with our earbuds. Using headphones or earbuds is a time-honored approach toward creating a private work zone, particularly in an open office setting. And each of us is different in what we’re listening to on our earbuds. Some are bopping their heads to the beat of their favorite song. Others are listening to their favorite podcast. Still others just need the gentle hum of instrumental music or nature sounds. We are each driven to motivation through several different avenues. Even though we spend quality time with our earbuds, we still need to come together as a team. Teamwork requires building relationships. An infrequently-used office whiteboard offered a great opportunity for us to build relationships without sacrificing productivity. Dubbed the #WorkplaceWhiteboard, it’s a place for the entire office to come together as our schedules allow, to better know one another. Company-sanctioned doodling on a centrally-located whiteboard can be good for office morale, also. This sort of “out-loud thinking” helps coworkers to get to know one another better, and, when backed by management, can help foster a stronger office environment. We have whiteboards positioned throughout the office. Most are used to keep track of important information like sales figures and customer service discussions. Our #WorkplaceWhiteboard, however, is available for every member of the team to add their own unique perspective. This whiteboard is centrally located and easily accessible. Several times throughout the week we post various questions and invite staffers to post their answers. 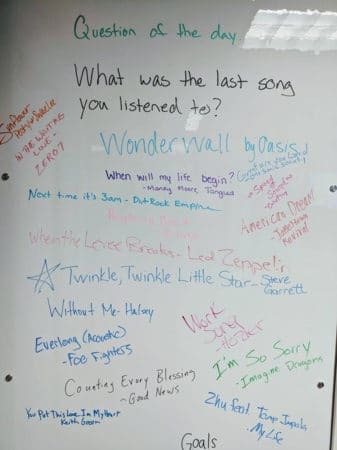 Our first question: What was the last song you listened to? In an office filled with earbud-wearing individuals, the board filled up quickly. Some of the songs listed were unfamiliar, and that generated a lot of discussion. It was fun to broaden our knowledge of other music genres and get to know a little bit more about our co-workers. What was the last book that had an impact on you? If you were on Dancing with the Stars, what song would you dance to? 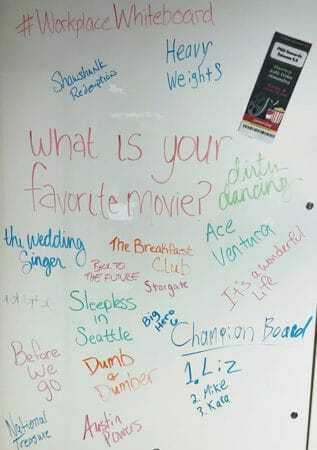 We often share our #WorkplaceWhiteboard questions and answers with our followers on Facebook, Instagram, and Twitter. It’s a great way to encourage discussion with others outside of our office. 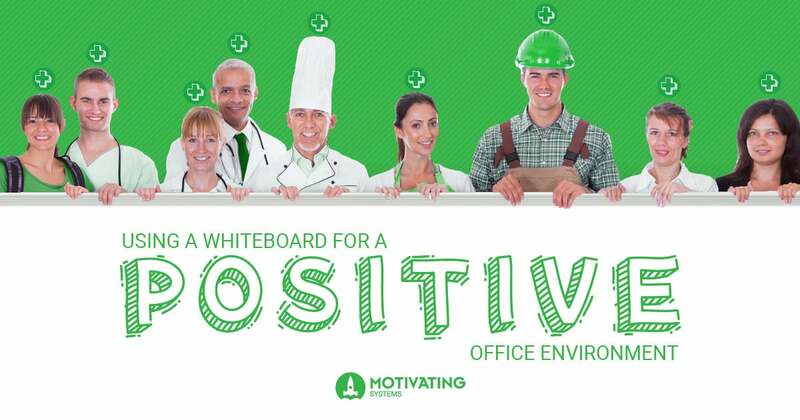 Because the mission of Motivating Systems revolves around helping schools and businesses build positive organizational culture, it’s important to have that positivity in our office, too. The surest route to that goal is through building personal relationships with our coworkers. The discussions generated by our whiteboard have helped us to know one another on a deeper level. With that knowledge comes increased trust and a more productive work environment. If you’re intrigued by the idea of our #WorkplaceWhiteboard, I encourage you to follow our social media accounts. You’ll get a peek behind the scenes of our growing company and our positive workplace culture!